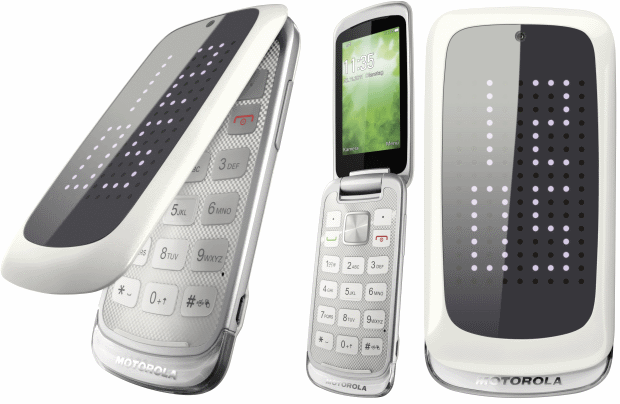 IDSTEIN, Germany – Feb. 9, 2012 – Motorola Mobility introduces Motorola GLEAM™+, the new slimmer, sleeker version of 2011’s elegantly designed and award-winning* flip phone for the style conscious. Priced at a suggested price of 99 Euro (w/o contract incl. VAT) the new phone will be available in silver and in winter white in March. Motorola GLEAM+ will be offered with Telekom and in retail shops among others. Motorola GLEAM+’s 13.5mm clamshell fits perfectly in your hand, whilst the simple and elegant design makes it truly stand out from the crowd. With its easy-to-use interface and clear, crisp screen, Motorola GLEAM+ is designed to be uncomplicated and intuitive so you can enjoy the fun of mobile life. The device showcases a modern LED matrix display that provides expressive notifications and alerts so you never need miss a call or message. It’s not just the aesthetics that will keep you entertained. Motorola GLEAM+ features both camera and video1 so you can snap, shoot and share your memories with friends and family whether in-person, via picture messaging or even social networks. Staying in touch is even easier, with added storage for your phonebook and text messages, as well as a faster, more powerful browser at your fingertips. There’s music too – with an FM radio, easy-to-navigate mp3 player and SD card support, the Motorola GLEAM+ gives you access to your music wherever you are.